Hey all! 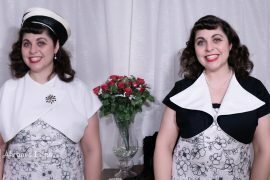 There’s more SewTubers popping up today with their video vlogs for The Day and Night Dress Challenge. This is your daily vlogs #2. Check out Dawn of Duelling Designs in her absolutely stunning cocktails look that she self drafted. She also makes a very fun knit dress for her coffee look that reminds me of oil pastels! Also, Akram of Akram’s Ideas made this fun, fun, fun ensemble with a fantastic source of inspiration. Both Dawn and Akram did magnificent jobs producing their Vlogs and their Day and Night Dresses! All inspiring takes! Two very talented ladies for sure!